From curing only two people in his least significant 12th miracle, Jesus now miraculously feeds 5,000 people for one of his most significant gematria miracles. The parable begins in verse 30 where the 12 disciples came down privately to a wilderness place. A vast crowd followed them on foot from all the cities and Jesus taught them many things. When it became very late, the disciples asked Jesus to send the crowd away so they could buy food. Jesus said the disciples themselves should give them food. The disciples said loaves of bread needed to feed the crowd would cost 200 denarii but all they could find was 5 loaves and 2 fish. Jesus commanded the crowd to recline according to hundreds and fifties. Jesus broke down the loaves and divided the fish and the disciples fed the vast crowd. 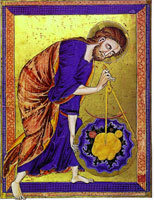 Then they picked up fragments enough to fill twelve baskets with bread and twelve with fish. And the ones who ate the loaves were 5,000 men. This is a magnificent gematria pericope. Every phrase in this 8 verse story tells how to draw the diagrams that illustrate how Jesus performed this miracle. Mark composed two Sacred Geometry stories about feeding a multitude of people. In the first story the twelve apostles return after Jesus gave them "authority" and sent them out "two by two." In the second story Jesus feeds another multitude including about 4,000 men with seven loaves and a few fish. The leftover fragments will fill 7 baskets (Mk 8:1-9). The gospel authors highly valued the story of how Jesus fed five thousand men because it is the only story that appears in all four gospels. On a literal level, the two stories report how Jesus feeds a multitude of people by means of a miracle. On a spiritual level, the two stories are allegories for receiving spiritual instruction and knowledge as food for the soul. The two stories are sacred geometry riddles using the Greek practices of isopsephia and gematria to "prove" the raising of Jesus. By identifying the isopsephia value of the key words in each story and correctly interpreting the drawing instructions disguised in the imagery of the narration, the underlying geometry diagrams in each story are constructed verse by verse. Characters: Jesus, the twelve disciples, a vast crowd, 5000 men. 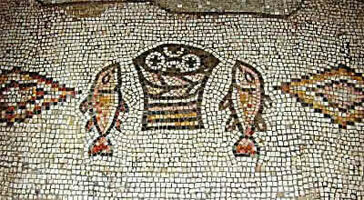 Signs of Objects mentioned in the story: 200 denarii, five loaves of bread, two fish, twelve baskets, fragments.